Ongoing Operations integrates HD quality voice communications with hosted Microsoft® Exchange® and Microsoft® Lync® for a truly unified communications suite. Using Ongoing Operations Hosted VoIP offering we fill the voice communications gap within Lync’s powerful collaboration application by providing a secure, rock solid dependable phone service that’s there when you need it for all your enterprise’s mission critical communications. OGO can provide a turnkey hosted Lync solution with our enterprise hosted PBX. Email is one of the most critical business applications. We will work with you to customize your solution to provide migration services (custom to your needs), a management portal to easily add and remove users and phone synchronization for iPhone®, BlackBerry®, Droid™ and Windows® Mobile. Microsoft® Lync® is an enterprise-ready unified communications platform. While many enterprise IT departments applaud Lync’s collaboration platform, they have not been willing to turn over their enterprise’s voice communication to the platform. By integrating OGO TALK, you get the best of both worlds. 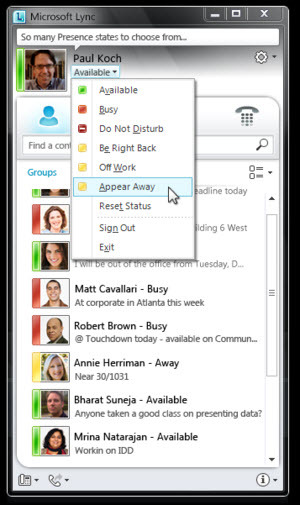 With Lync and OGO TALK, users can keep track of their contacts’ availability; send an IM; start or join an audio, video, or web conference; or make a phone call – all through a consistent, familiar interface. Lync is built to fully integrate with Microsoft Office.